Zulfikar Ali Bhutto returned to Pakistan after completing his studies in Berkeley and Oxford, and training as a barrister at Lincoln’s Inn, and joined President Iskander Mirza’s cabinet as the minister of commerce. Mirza’s government was removed after a short stint. Bhutto was made the minister of Water and Power, Communications and Industry in the then army chief General Ayub Khan’s era, who had assumed the position of Chief Martial Law Administrator (CMLA) after removing Iskander Mirza’s government in a coup d’etat. Gradually, Bhutto rose in influence and power as Ayub Khan’s reliance on him increased with the passage of time. The dictator trusted Bhutto so much that he made him the foreign minister of the country in 1963. Bhutto was removed from power on July 5, 1977 by General Zia ul-Haque. He was sent to jail in the Mahmood Ali Kasuri murder case, filed by Kasuri’s son, lawyer and politician Ahmad Raza Kasuri. And he was finally sentenced to death in a 4-3 split decision of Supreme Court. On his 39th death anniversary, let’s look at few highlights of Bhutto’s political career. 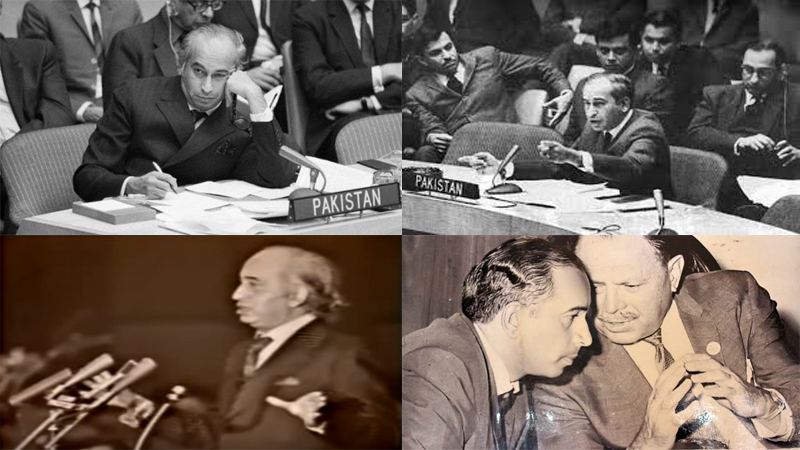 Historic speech in UN Security Council by Zulfikar Ali Bhutto during the turbulent time in East Pakistan (Bangladesh).